Over the past couple of days, we’ve looked at the top decks in London and broken down my stats from November (and the past three months overall) on PTCGO. Logically, the next step involves analyzing and identifying weaknesses of the current meta and then rubbing the crystal ball and seeing what direction the meta might head in the next month or two. The meta solidifies (even becomes “stale” by late January) at this time of the year as we begin to find optimal decklists for the various top tier Pokemon. That makes this a very good time to objectively look at the current state of the card game and project what the game will be like over the next two months. Enhanced Hammer – I’m going to try to find time to do a study on Enhanced Hammer again. I did this back in August, and I actually won more without E Hammer than with it. My stats from the past three months confirm: I do better against decks that don’t run hammers (it’s the most perplexing stat of everything I track, it’s very confounding). However, all of the top tier decks in London ran four of some type of Special Energy. In my mind, this seems like a no brainer to tech in at least two if not four. 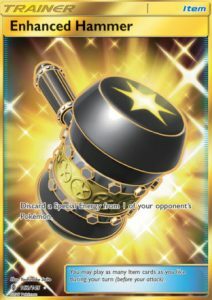 All of the top tier decks rely heavily on SPE. I don’t see that changing any time soon. Moreover, all but one of the top decks in London did not run Special Charge (I do see that changing soon). I need to do another analysis to confirm this, but the theorymon behind running E Hammers isn’t bad. Hoopa (Shining Legends, 55/73) and Ninetales (Burning Shadows, 28/147) – I can’t get these guys to work, but my brain keeps telling me they should be destroying the current meta. My brain keeps saying, “You should be able to run a quad Hoopa deck and frustrate the heck out of every meta player out there today.” Of course, I mention Greninja, Volcanion, Zoroark, Gallade, and Garbodor (Breakpoint, 57/122) (more on him later) to my brain, and my brain simply responds by asking me why I’m talking to myself. Regardless, the stats aren’t there to back it up: I went 5 W 7 L (3 W 4 L against meta decks) with a Hoopa Sableye (Guardians Rising, 80/145) deck. The theorymon seems good – park Hoopa in the active and go about setting up your deck as you please while your opponent bangs his head against a wall – I just haven’t figured out how to get it to translate over into realitymon. Stage 1’s and 2’s – Until the Ultra Beasts came around, I was starting to think that the era of big basics was over. Remember last year how we all just smacked each other around with Yveltal EX and Darkrai EX? You couldn’t knock the Fighting Fury Belt off so it’d have a ridiculous 210 or 220 HP. Even with the Ultra Beasts, however, the meta is still very evolution prominent, making it vulnerable to cards such as Po Town and Espeon EX. Also, evolutions slow the pace of the game down a little bit, so if you can hit for numbers on turn two, you’re going to have some success. High energy attack costs – I will say that the top eight at London had a number of Pokemon that could potentially attack with a single attachment: Golisopod GX, Zoroark GX, Gardevoir GX (using Max Potions), Greninja. However, many of the top decks out there are still two attachment attackers (including some mentioned immediately above). Multiple attachments makes it harder to Acerola or Max Potion your Pokemon. 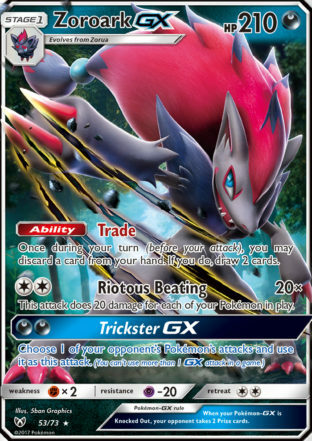 It’s my guess, but I would not be surprised if someone comes up with another Max Potion or Acerola type list for Zoroark GX similar to the one that was very common in London for Gardevoir GX. Ability dependence – abilities dominated strategy in London. Every deck was built around abilities, using them early and often as an integral part of their developmental and offensive plans. I would again suspect that the pendulum will swing back the other way at the next major tournament (Memphis in two weeks I think? ), and I have little doubt that we will see more Garbotoxin Garbodor. Especially considering how only Tord Reklev’s list ran four field blowers, it seems to me that Garbodor should still function at least minimally to disrupt your opponent. I played some Grampa about a week and a half ago and rocked with it, but I’ve heard that Grampa was all over the place in London, it just didn’t do very well. Still, after seeing Tord carry four Leaf Blowers, I would not be surprised if the meta doesn’t start moving in that direction as well. That’s my analysis – undoubtedly, there’s stuff in there that’s not right … or at least won’t be reflective of the direction the meta moves in the immediate future. If I have to put it in a top three, I would say that the three biggest things that will change post London would be the increased use of E Hammers, a return in the usage of Garbotoxin Garbodor, and a focus on single energy attachment attacks. I’m with you on Hoopa/Ninetales. haven’t found a way to get this to work consistently. You’d think with Hex Maniac out of Standard and the heavy EX/GX format (no Night March, no Vespiquen, etc. 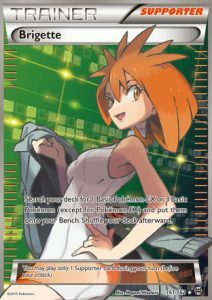 and the decline of decks like Passimian, Rainbow Road, etc.) these cards would flourish. But if there’s a easy strategy with these cards, I haven’t found it. Yes that looks like a good strategy, definitely arrow pointing up. Wouldn’t it be funny if Umbreon became more commonly used now than Espeon! Stefan – good idea! One of my favorite decks was a Gengar EX/Robo Sub. Basically you kept your opponent from collecting prizes while you hit & run with Dark Corridor. I teamed it with Noct Owl and tons of item cards. AZ & Scoop also helped from KOs. Fun deck to play, and pretty strong. Pokemon says I was 17-6 with that deck.